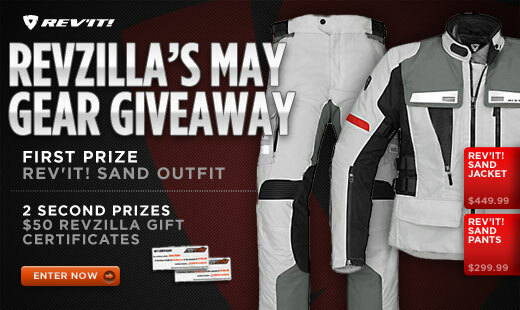 Tilted Horizons: RevZilla "May" Give You Some Gear! RevZilla "May" Give You Some Gear! Wanna win some top-notch adventure/sport-touring gear? RevZilla makes it easy peasy: click here, spend all of about 30 seconds creating a Rider Profile, than sit back and wait for the monthly winners to be drawn in RevZilla's continuing monthly series of giveaways. The First Prize winner this month will receive a suit consisting of a Rev'It! Sand jacket and over pants, together valued at about $750. RevZilla $50 gift certificates will go to two Second Prize winners. While you're on RevZilla's site, take a look around at what RevZilla has to offer the serious motorcyclist. Why shop RevZilla? I can tell you why I do: fast, free shipping for orders over $39.99; TeamZilla cash back program; "no hassle" exchanges; price match guarantee; and above all, RevZilla's top-flight reputation among riders I know for its customer service and product knowledge. I placed an order just yesterday for some Arai helmet replacement parts and I've already received confirmation they've been shipped; that's super-quick service anyone can appreciate. Let 'em know Tilted Horizons sent ya!